Hello my friends! Are you okay? This way all doing great! I just to form my second makeup classs in professionalizing institute Embelleze here in the city of Ubatuba, and I am very proud of their learning, and happy to get pass all the information I could to them! Anyway, let's the subject of today's post! I received from my beautiful partner the Born Pretty Store a kit with 5 pairs of eyelashes, which are beautiful and similar to the natural. Continue reading to learn more! The tufts contains five yarns - more or less - in each one, so is more "thin" and natural than those fuller eyelashes yarns in each tuft. 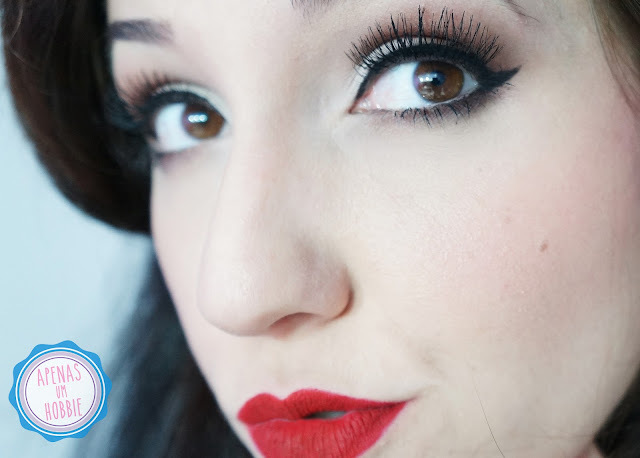 Of course, anyone who wants to can pass mask these eyelashes after applied and highlight it some more! 1. First we remove the eyelashes of the box, I do it with the tweezers. 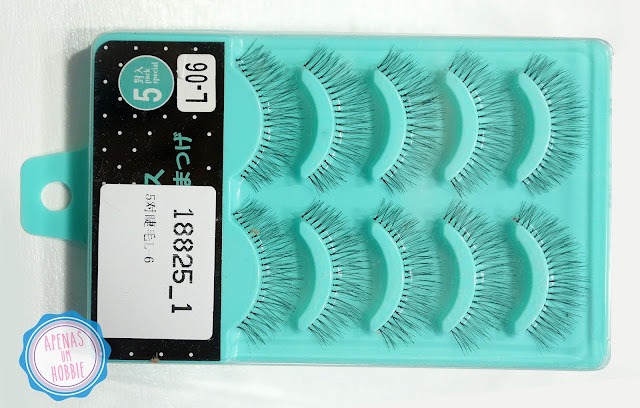 For these eyelashes it is already stuck in the plastic, so be careful when you pull to not spoil his format. 2. Before applying we should measuring the eyelashes and compare it to the natural, just as I am doing in the picture, looking at this photo you can see that his size is much larger (I'm talking about the width of it ok? Not the length of the wires ) than the width of my eye. 3. After measuring the lashes I cut the leftover of it. Here it is worth remembering something IMPORTANT, when you cut the lashes and it is these asymmetric (larger yarns on one side and smaller than the other), you must remember to cut the part of the longest yarns, and leave the smaller wires going to fit in with the beginning of your eye. 4. Here I am applying the glue. I purchased this glue of the brand DUO, which comes with brush applicator, I recommend it highly! It is more practical, applied with a brush. 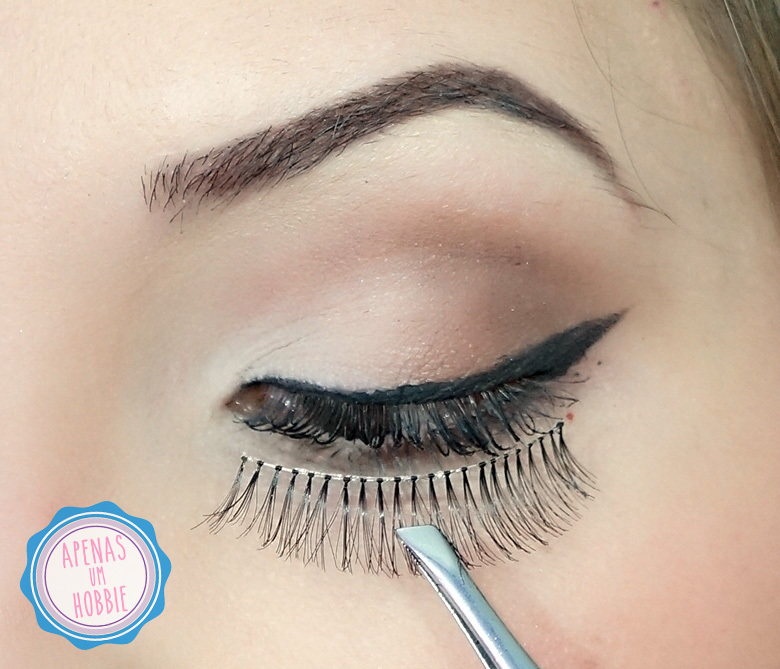 After applying the glue, remember to wait 30 seconds to 1 minute before putting the eyelashes, for the glue take effect. 5. I have this applicator eyelashes that makes life easier, but it is also possible to place the lashes with normal tweezers, and also with the fingers. I simulate where I want the cilium begins and ends before putting it in fact. 6. I prefer to start putting the eyelashes, of the final to the beginning of the eye, place the part with glue near the root of the lashes, which still has skin. I hold this point already stuck with a finger, and I'm pushing the other parts with the tweezers until the entire eyelashes are glued. DISCOUNT COUPON " APEG10 "
How about knowing the store ?! It has several cheap international products, and the good thing is that you know that these products arrive, since I got 4 of them from the store! Armaria que não sei inglês, kkk .. Ainda bem que existe o Google tradutor, rs .. Mas, pela imagem da para entender um pouco também .. ótimas dicas.. adoro cílios postiços, acho perfeito!